Chicago, IL–(ENEWSPF)– When you think of Tyrannosaurus rex, you probably imagine the unique physical traits that defined the species: a large skull and tiny forearms attached to a tremendous body. But, researchers have just unearthed a much smaller tyrannosaurid in China, no more than three meters tall, that displays all the same features – and predates the T. rex by tens of millions of years. This finding means that such specialized physical features did not evolve as the prehistoric predators grew in size, but instead, they were present for feeding efficiency at all sizes of the dinosaurs during their reign in the Cretaceous Period. A 9-foot dinosaur from northeastern China had evolved all the hallmark anatomical features of Tyrannosaurus rex at least 125 million years ago. University of Chicago paleontologist Paul Sereno and five co-authors describe the newly discovered dinosaur in the Sept. 17 Science Express, advanced online edition of the journal Science. Paul Sereno and colleagues studied the new, small-bodied fossil, known as Raptorex kriegsteini, and estimated that it was a young adult, about five or six years old when it died. The researchers examined the skull, teeth, nose, spine, shoulders, forearms, pelvis, and hind legs of the new fossil, comparing the features to larger evolutionary versions of tyrannosaurid dinosaurs. They conclude that the specialized feeding features, or “predatory skeletal design,” of R. kriegsteini were simply scaled up with little modification in its descendants, whose body masses eventually grew to 90 times the size of R. kriegsteini. Sereno and his colleagues also use this new fossil to propose and describe three major morphological stages in the evolutionary history of tyrannosaurid dinosaurs. 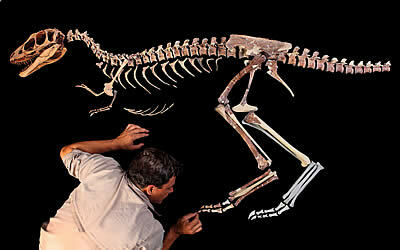 Henry Kriegstein, a private fossil collector, brought the nearly complete Raptorex skeleton to Sereno’s attention after buying it from a vendor. After Sereno and colleagues finish amore detailed study of Raptorex, it will be returned to a museum in Inner Mongolia, the place where the fossil was illicitly excavated. 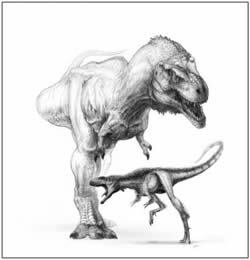 Citation: Paul C. Sereno, Lin Tan, Stephen L. Brusatte, Henry J. Kriegstein, Xijin Zhao and Karen Cloward, “Tyrannosaurid Skeletal Design First Evolved at Small Body Size,” early online edition of Science, Sept. 17, 2009. Funding sources: The Whitten-Newman Foundation and the National Geographic Society. On TV: Raptorex will appear in the world premiere special BIZARRE DINOS, on the National Geographic Channel at 8 p.m. ET/PT Sundy, Oct. 11.